For the second time in a month, President Donald Trump is reportedly set to make a controversial nomination to the Federal Reserve Board. Axios reported Thursday that Trump plans to fill a seat on the monetary policy-making board with Herman Cain, a Republican presidential candidate during the 2012 cycle who briefly led in the primary polls while touting a “9-9-9” tax plan, withdrew, and has since used his email list to grift people. Trump is reportedly waiting until Cain’s background check is complete to make an official announcement. That may end up complicating matters, as Cain has been accused of sexual misconduct by at least four women — allegations that, along with revelations of a long-term extramarital affair, prompted him to end his presidential campaign in December 2011. 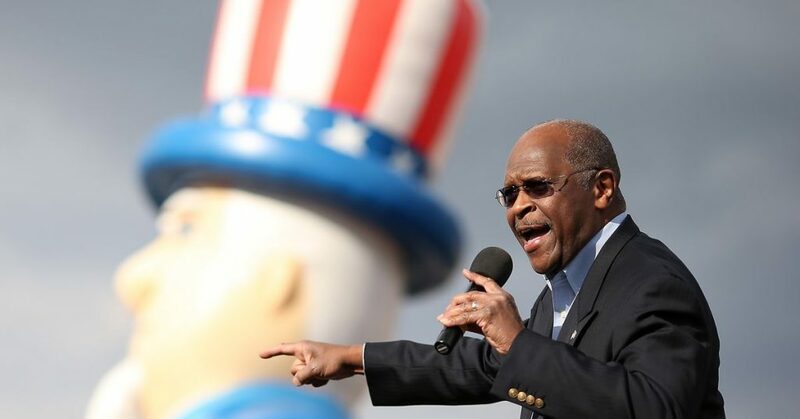 News that Trump plans to nominate Cain comes less than a month after he announced that he plans to fill another opening on the board with Stephen Moore, an economic commentator who is perhaps best known for playing a staunch Trump loyalist on CNN. Cain is actually more qualified for the job than Moore. From 1992 to 1996, he served as director of the Federal Reserve Bank of Kansas City. As far as economic policy goes, Cain is perhaps best known for his “9-9-9” tax proposal, which would’ve replaced the US tax system with a flat tax of 9 percent on businesses, personal income, and sales. News that Trump plans to nominate Cain came hours after Trump posted his latest tweet criticizing the Fed for the interest rate hikes it implemented during his first two years in office. He told Bloomberg News in an interview that he’s concerned the Fed was overly aggressive with interest rate increases in the last year, but didn’t respond to follow-up questions about his column defending higher rates. Moore has also fretted publicly about “deflation,” even though it’s not actually occurring. That, however, doesn’t seem to matter much to the president, who regularly blames raising interest rates for any less-than-exemplary economic trends. In waiting for Cain’s background check to be completed before making his nomination official, Trump is doing more to vet him than he did with Moore. Trump announced his intention to nominate Moore in a tweet on March 22. Within days, news broke that Moore owed the federal government $75,000 in unpaid taxes and was held in contempt in 2012 for failure to pay $300,000 in alimony and other divorce payments. The chain of events is reminiscent of what happened about a year ago with Ronny Jackson, Trump’s former White House physician and onetime choice to lead the Department of Veterans Affairs. Shortly after Trump announced Jackson as his pick to lead the VA, reports emerged about him drinking on the job and mistreating staff. Jackson’s nomination was eventually pulled. More recently, in February, Trump’s pick for United Nations ambassador, Heather Nauert, withdrew from consideration for the job amid reports that she employed a nanny who was in the country legally but didn’t have a proper work permit. Nominees to the Fed must be approved by the Senate. Moore’s nomination still hasn’t yet been officially submitted. Next articleHoward Schultz hasn’t gotten into policy specifics. Here are 4 ideas from women candidates who have.